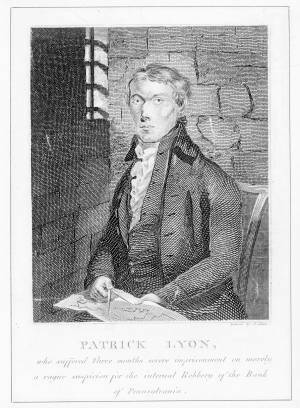 PATRICK LYON, who suffered Three months severe imprisonment on merely a vague suspicion for the internal Robbery of the Bank of Pennsylvania. Portrait of the Philadelphia blacksmith and locksmith who became a well-known victim of judicial injustice. Lyon, who had manufactured the iron doors and locks for the vault of the Bank of Pennsylvania, was falsely convicted of its robbery in 1798. Here he is shown seated in a prison cell, holding a draftsman's compass and a drawing. The print served as frontispiece to the book "The True Narrative of Patrick Lyon . . . (Philadelphia, Printed by Francis and Robert Bailey, 1799). The book's introduction contains a plea for equal justice for rich and poor alike in the United States.